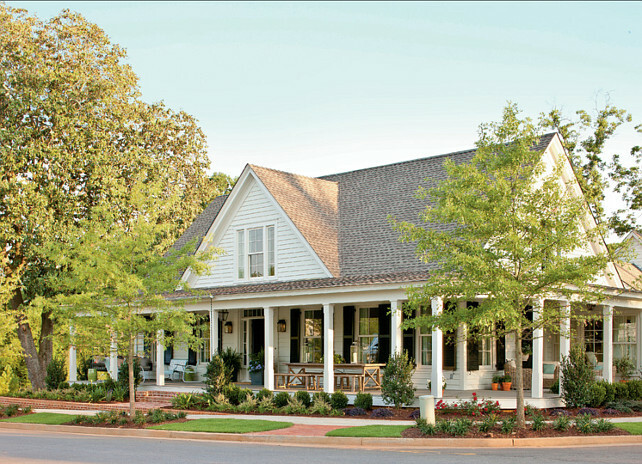 Designed by Historical Concepts, this former Southern Living Idea House, located in the small town of Senoia, Georgia was the magazine’s first ever historic renovation project. 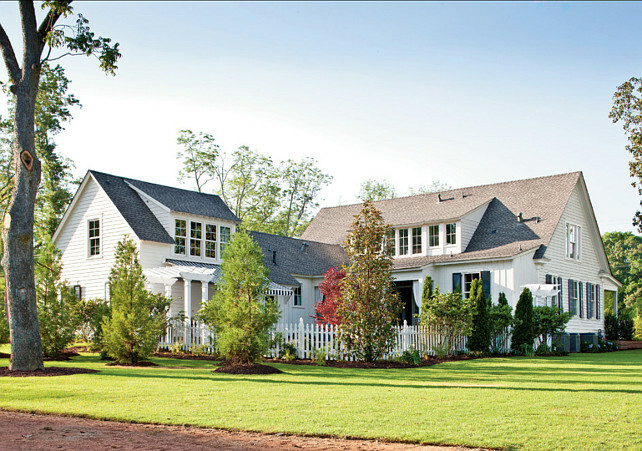 Over a period of seven months, a tired 19th century home was transformed into a charming and up-to-date farmhouse. Multiple renovations had masked much of the historic character, so the restoration began by peeling back generations of changes to uncover the essence of the 1830s home. The design team then set out to salvage what remained of the home’s original materials, retaining heart pine floors and hand planed wall boards. Additions sympathetic to the style and massing provided room for porches, a laundry room, mudroom, office and carriage house, accommodating modern living while staying true to the home’s architectural heritage and rural roots. 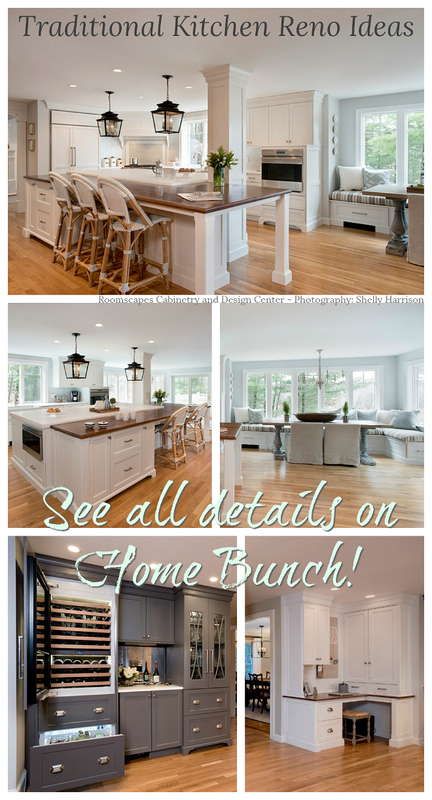 Take a minute and I am sure you will feel inspired by the many interior design ideas this farmhouse provides. Exterior Paint Color Ideas: Siding and Trim Paint Color “Sherwin-Williams SW6994 Natural Choice”. The shutters are painted in “Greenblack (SW6994) by Sherwin Williams”. 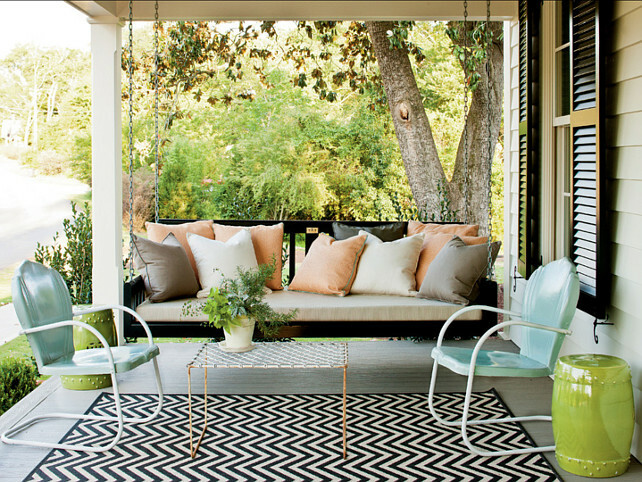 I can’t help but fall in love with a home with a porch swing. This swing is from “Original Charleston Bedswing”. Character was also added to the porch with a pair of vintage metal chairs painted with two coats of an exterior oil-based color. 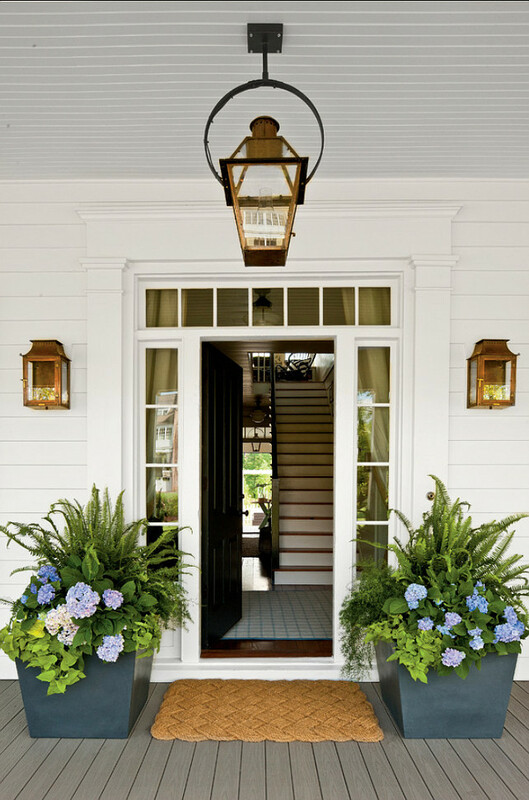 A perfect front entry! Exterior Lighting: Wall lanterns are the “Williamsburg 16” Flush Mount in Natural Gas by “Bevolo”. Hanging lantern is the “French Quarter 21” on Yoke Brachet in Eletric, also from “Bevolo”. Door mat is the Braided Coir Doormat, Double Wide, from Restoration Hardware. 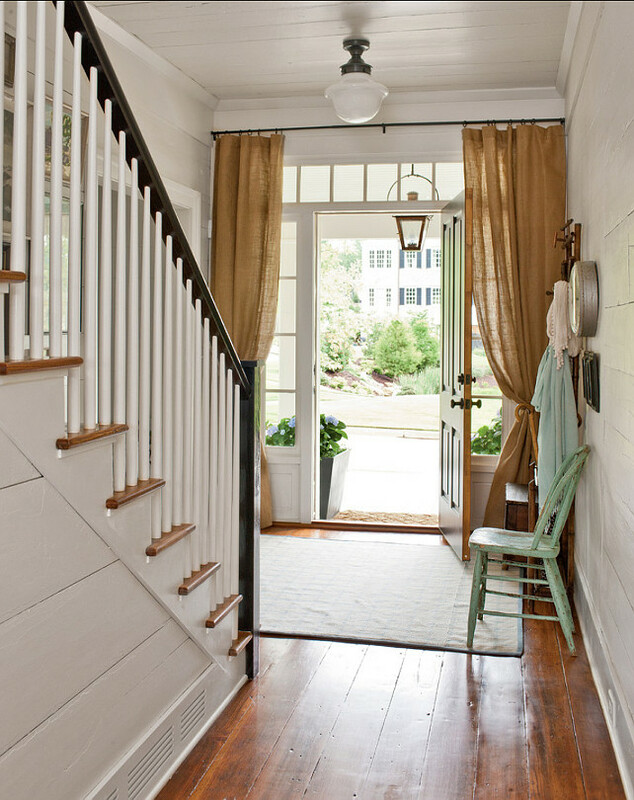 The central hallway runs straight from the front door to the back, letting natural light and traffic flow easily. Burlap draperies (Ballard Essentials Panel in Burlap from Ballard Designs) are brought to add a casual feel to the space. Light Fixture: Short School House Flush Mount from Circa Lighting. 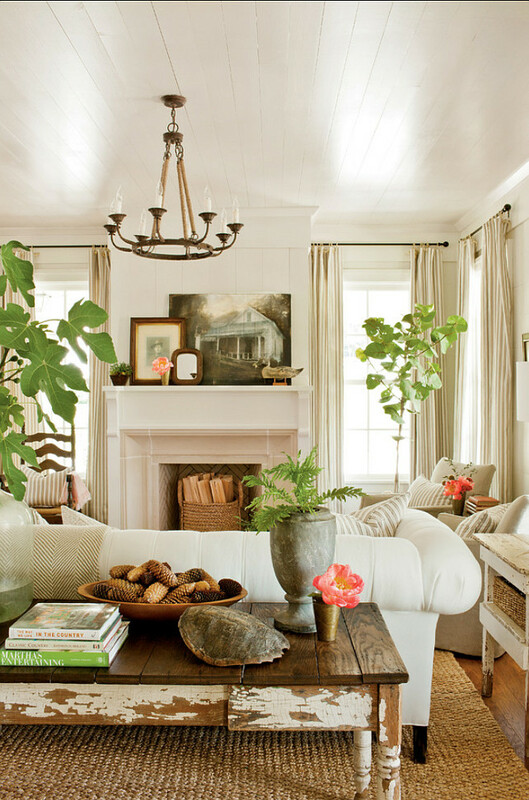 Neutral and natural elements are beautifully combined in this living room. From white fabric to dark wood, this neutral room feels more interesting thanks to the mix of various tones. This tufted chesterfield sofa is covered in family-friendly Sunbrella fabric. A console table is placed behind the sofa to create balance in the space. Throw is from Serena and Lily (Herringbone Throw in Stone). The pillows were custom in Fluting Stripe, a fabric available through Tracery Interiors. Chandelier is the “Laurenza 8 light chandelier” by Ballard Designs. Mixing seating in a dining room can create a more collected look. Comfortable wing chairs, a settee and burlap-topped benches bring interest and personality to the dining room. The hanging lantern is perfect to add a casual feel to any space. Lantern is the “Calisse 4-Light Lantern” from Ballard Designs. 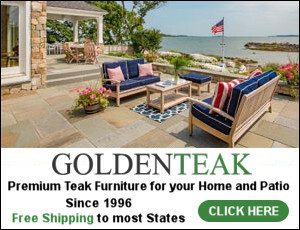 Table is “Bologna Two Tone Dining Table” (discontinued) from Ballard Designs. 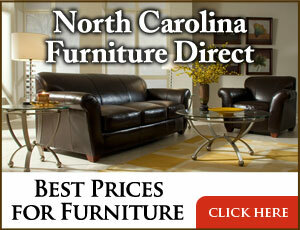 Benches are the “Wood Plank Storage Bench”, also from Ballard Designs. Dining Room Dimensions: roughly 10×13. The shaker-style cabinets by IKEA have a modern-vintage look that works in a classic farmhouse setting. As in fashion, it’s okay to pair gold and silver. Unlacquered brass on the lights works with IKEA’s stainless steel appliances and chrome hardware. Kitchen Cabinet Frames: AKURUM in white for Ikea. Kitchen Doors & Faces: ADEL (100.786.54) in Off-White for Ikea. Kitchen Backsplash: The kitchen backsplash in this home is “Modern Dimensions Matte Arctic White 4¼”x8½” (0790)” by daltile.com. 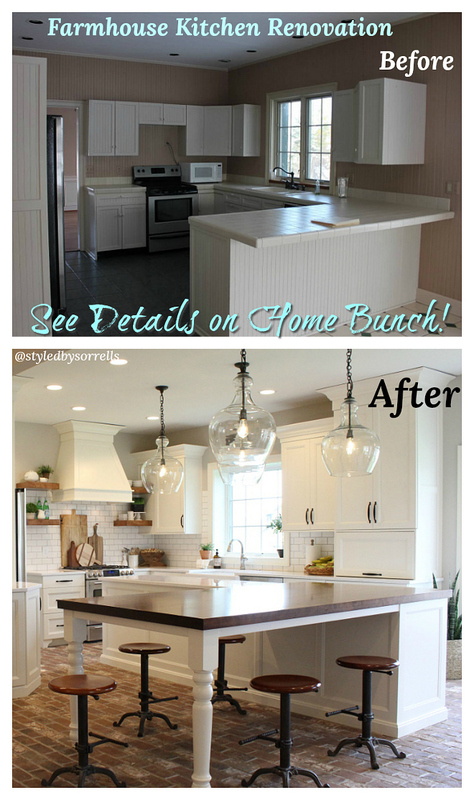 The stack subway-style are tile up to the undersides of the cabinets, and use dark grout for a modern look that’s easy to clean. Countertop: countertops are Absolute Noir (6100) by Caesarstone (caesarstone.com). The island is approximately 10′-12′ wide. 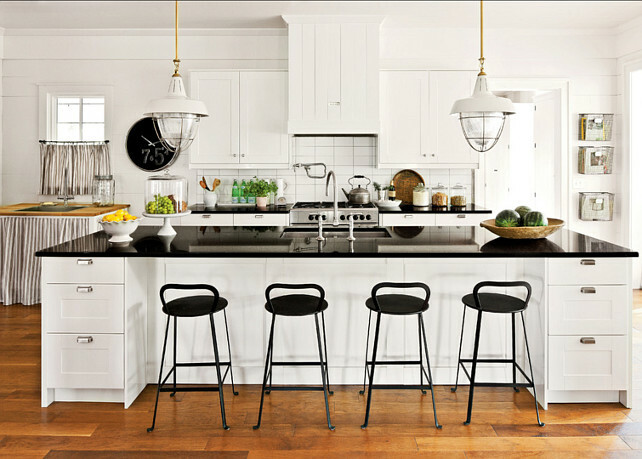 Bar stools are the “Rutland Counter Stool” from Ballard Designs. Don’t waste the space you have under the stairs! Here, the designers created a cozy area that is perfect for reading. The walls are original to the home (1910). If you look, you can see that the board edges are uneven. That’s because these were hand planed, unlike commercially produced boards today. In new homes, you can use a lot of simple pine or cypress boards, just butted together, to achieve a similar look. Ceiling, wall and trim Paint Color: “Pearly White (SW7009) by Sherwin-Williams. 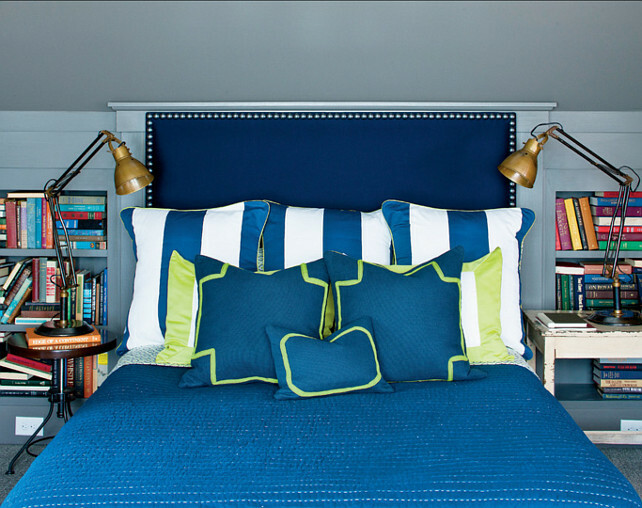 Since this is a big master bedroom, the designer chose a fully upholstered headboard and footboard to anchor the room. Doesn’t it look comfy? 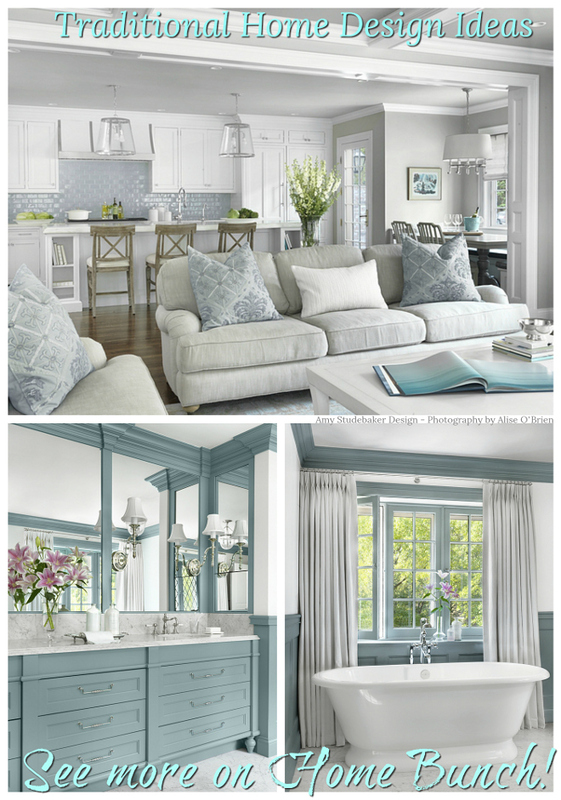 Paint Color: Pearly White (SW7009) by Sherwin-Williams. The vanity color is Gauntlet Gray (SW7019) by Sherwin Williams. Can’t find an art piece you love? Try to hang your family photos in matching frames in a random pattern. Try to use wallpaper in a small space to make a big statement! 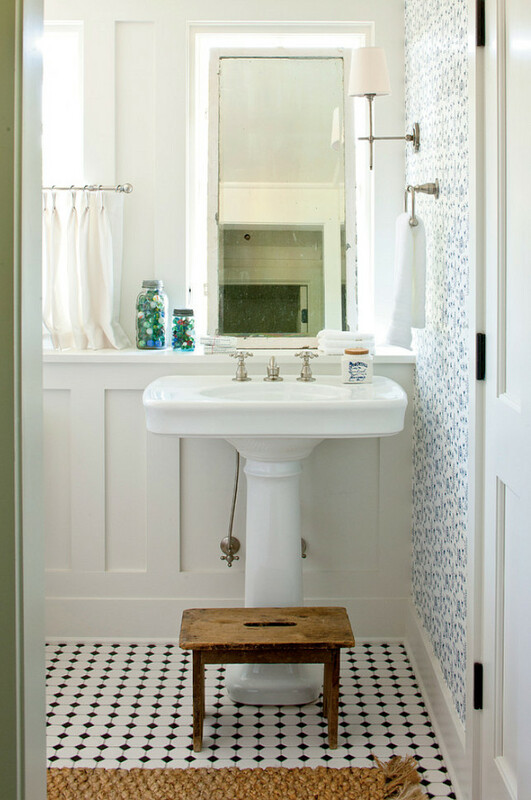 The wallpaper in this small bathroom is “Animal Farm” in Blue Ribbon (SPW-W1072-02) by Studio Printworks. 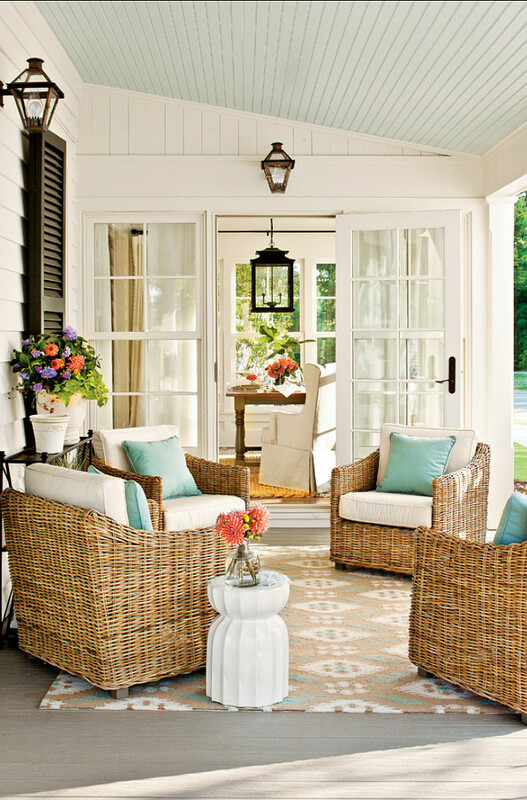 The porch ceiling’s pale blue hue is carried through to the pillows and rug. Stools stand in as side tables. Rug is the Suzanne Kasler Ikat Rug for Ballard Designs. 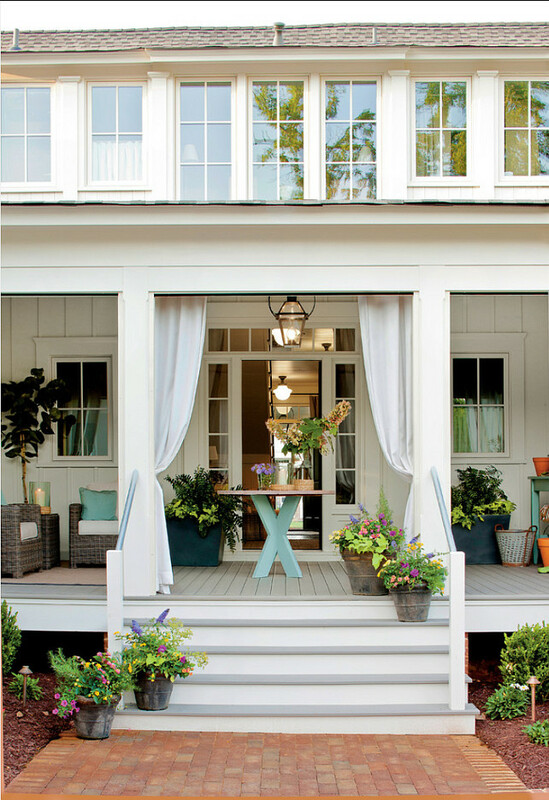 Outdoor curtains give this porch the feel of a finished room. This backyard is just perfect! 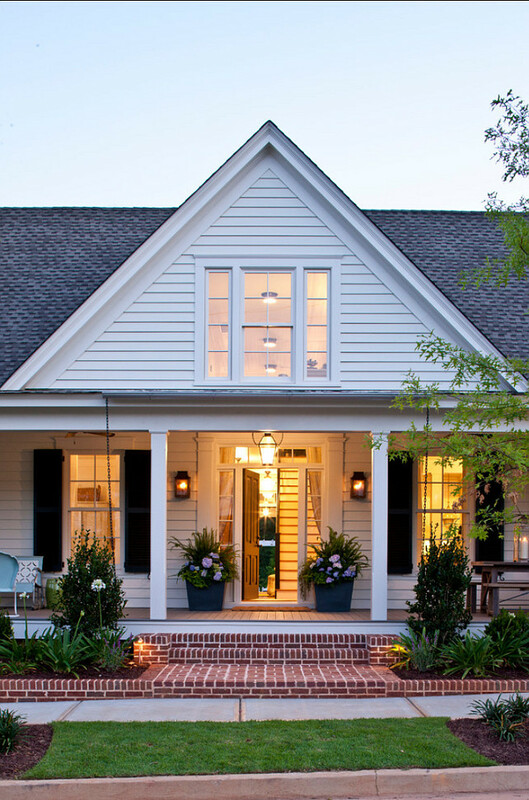 Great design, landscaping and even white picket fence. How dreamy is that?! 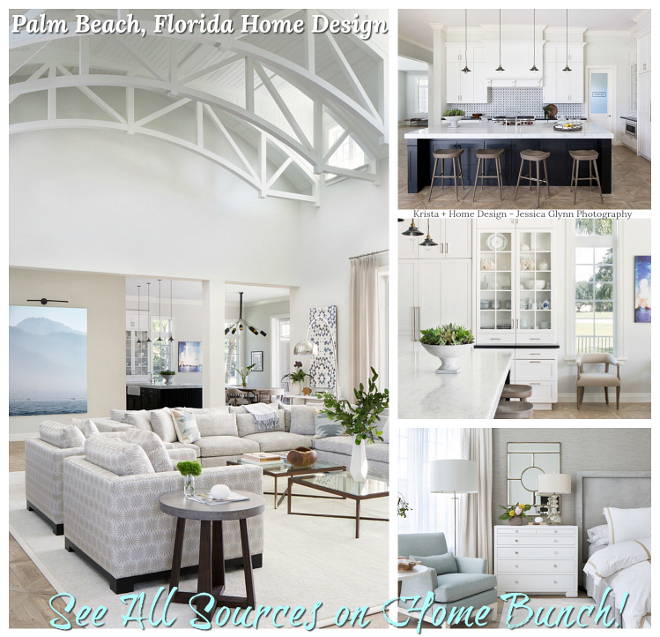 Sources: Historical Concepts, Interiors by Tracery Interiors. Photography: Laurey W. Glenn. How’s everything with you? 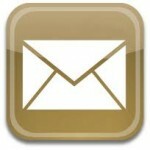 I am having a very busy week (work, work and more work!) and I have to say that I am really looking forward summer. I can’t wait for the kids to be off the school so we can spend the day without having to get up too early and just enjoy what each day will bring… I know it will be louder around here, but that is a “noise” that makes my life richer. Enjoy your day and pay attention to what’s around you… we should never take for granted the people that we share our lives with. Wow beautiful. 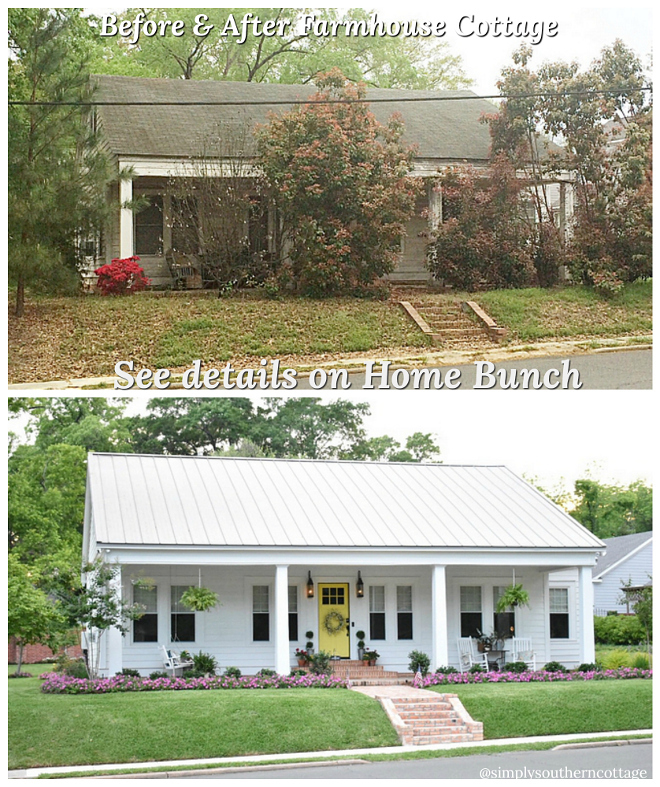 I LOVE front porches….does it get better? I need to eventually retire in a home with a front porch!! 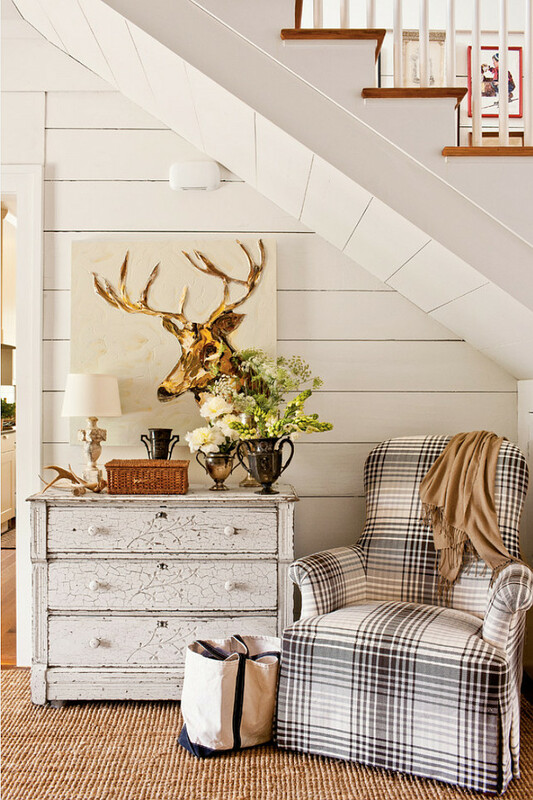 I love this casual country style and will incorporate many of the design ideas in my own home. This is an incredible floor plan and beautiful home! I don’t care for the layout of the kitchen, but I suppose it can be altered by a good designer. Thank you for sharing your thoughts! what paint finish did you use for the Pearly white interior? Semi gloss, flat, satin??? ?